February is, of course, the month for valentines, and there’s no better way to share your romantic feelings than with food. Whip up our Cheap & Cheerful romantic three course dinner and it will cost a lot less (and possibly taste better) than it would to go out. If you do want to brave the couple-crowds, turn to Eating Out where we’ve done all the leg work for you — no more ‘chef says he can do a green salad’. Still on the theme of love, our Chef of the Month, Kim Brewser, has crafted an incredible cake to celebrate — so if that’s what your sweetheart likes, get baking. And one writer has selflessly taken a trip to the City of Love, Paris, to report on the vegan options. (Let’s just say ‘a whole lot better than they used to be’). We’re also looking at the glories of world cuisine, with Vietnamese pho, the secret recipes of the Cuban paladares — where locals open their homes as restaurants and cook fresh, fabulous food — and Italian regional cookery that will inspire you way beyond Bolognese. 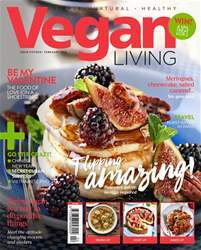 And talking of inspiring, our feature this month focuses on the vegans who are really making a difference, whether though cooking, filming, writing, or speaking out. If the weather’s getting you down, cheer yourself up with some Shrove Tuesday pancakes — absolutely no eggs or milk needed. They’re certain to put a smile on your face — as will winning a gorgeous spa day for two! Happy reading!